Many fields are exhibiting symptoms of interveinal chlorosis and necrosis. In the some areas (hot spots), leaves are burning up and dying. In the worse fields, entire plants are dying. Sometimes the leaves are falling off the petiole; in other cases, the leaves remain attached. 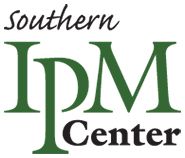 The symptoms look similar to, but usually worse than, various nutrient deficiencies. Actually, what is occurring is very similar to a nutrient deficiency in that something is restricting the roots and/or vascular system from moving water and nutrients through the plants. If you start seeing such symptoms, dig some roots and examine them. Then, split the stem and tap root. If you see any discoloring, then you likely have a stem/root disease. 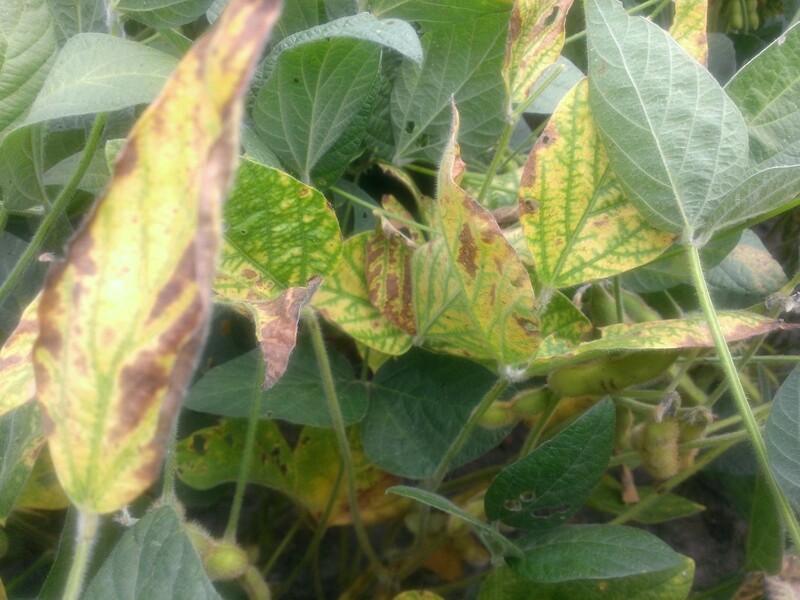 Is this sudden death syndrome (SDS)? Maybe. We tend to hear a lot about this disease in the media, in a seed catalog ratings, and throughout many extension bulletins in the Midwest. Although the name makes the disease sound like the entire field is getting ready to die, this is not usually the case. Up until this year, SDS was neither devastating nor widespread in Virginia. However, we are seeing more than the usual cases this year. It appears that the disease spreads suddenly; you don’t see it one week, but the parts of the field begin dying the next. In reality, it has been building up slowly as the season progresses. The infection actually took place much earlier in the year. Regardless, SDS will rarely result in widespread death of the soybean crop. Instead, you will usually see it in spots and patches in the field. 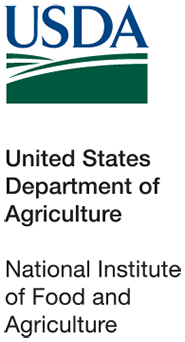 Worth noting is that SDS is commonly associated with soybean cyst nematode infestations. So, if your field has been diagnosed with SDS, then you may want to sample for nematodes. Below is a photo of one of our on-farm soybean variety tests. It is one of the worst cases of SDS that I have ever seen. Although a few varieties are more tolerant to the disease than others, it appeared to affect all of the varieties to some extent. 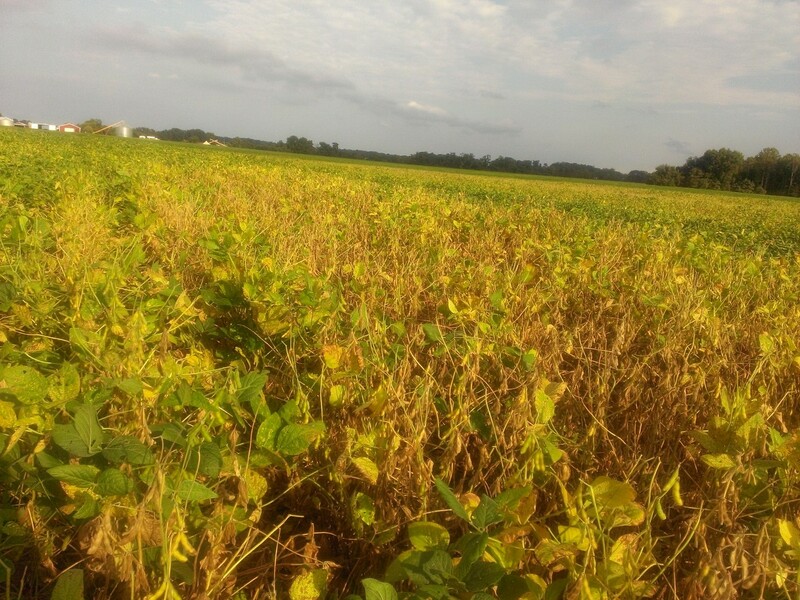 Although SDS is turning up in several fields this year, the same above-ground symptoms are also association with brown stem rot (BSR), which has been the most common root/stem disease in Virginia. Some of the plant samples that have come through our plant pathology lab have been diagnosed as BSR. It usually doesn’t cause widespread death and it usually limited to small spots or patches in the field. In general, it will not continue to spread over the rest of the field; however, the patches will enlarge over time. Yield loss is usually minimum and restricted to the infected areas. As mentioned earlier, if plants begin suddenly showing above-ground symptoms, dig the roots and split some stems. If the pith (center) of the stem and taproot right at the soil level is brown, then the cause is likely (but not always) BSR. If you see a white pith and the rest of the root is brown, then the disease could be SDS. Another diagnostic tool is to look at the leaves. 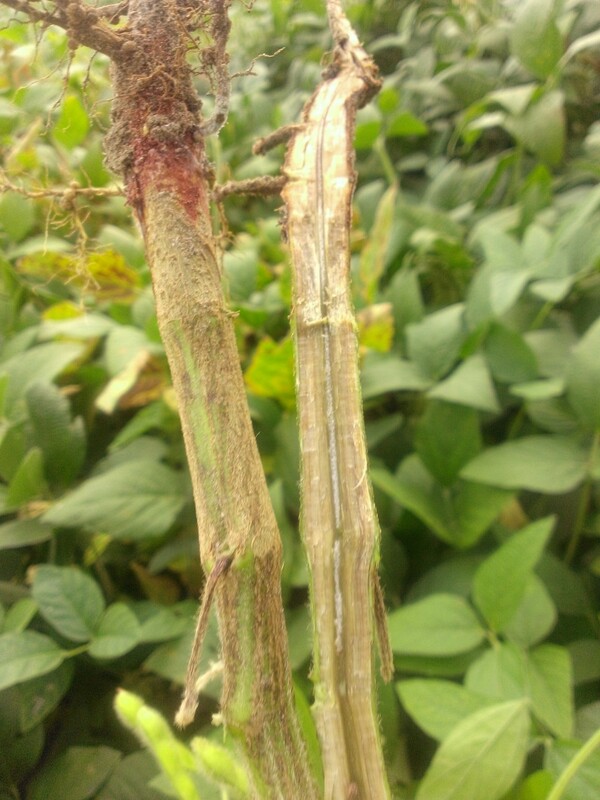 If the leaflets fall off but leave the petiole attached to the stem, it is likely SDS. if the leaves don’t fall, it’s likely BSR. 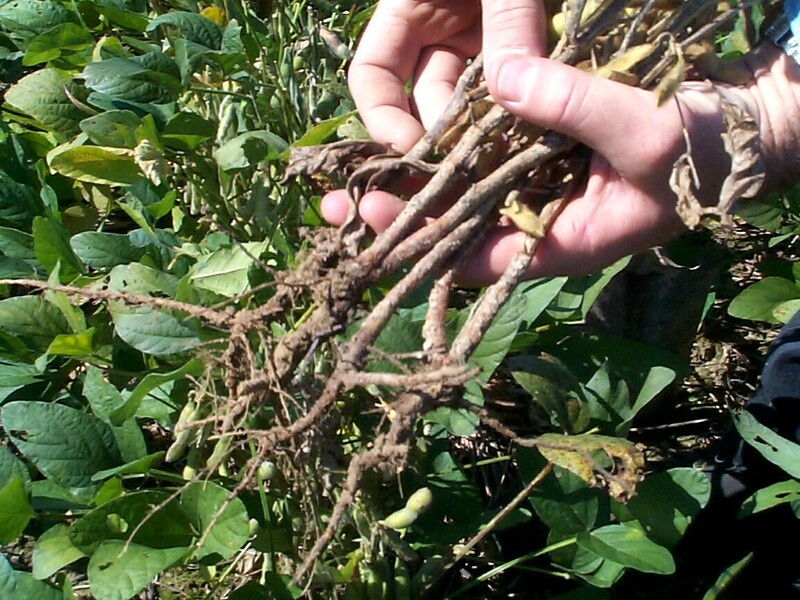 Finally, you’ll seed more rotted roots with SDS. But, to find the rotted roots, you’ll need to dig them up and wash the soil from the roots. Jerking the plant out of the ground will likely strip off most of the roots. The last disease that could be a problem and exhibit the same symptoms is red crown rot (in peanut, this is called cylindrocladium black rot or CBR). This disease can however be recognized by red fruiting bodies found at the base of the stem. Red crown rot was more common when Virginia’s peanut acreage was greater and soybean and peanut were being rotated with each other. Regardless of the disease, what can you do about it? Unfortunately, there is nothing that can be done this year. Foliar fungicides will not control a disease that is inside the stem and roots. But, in the future, rotate out of soybean for one or more years. 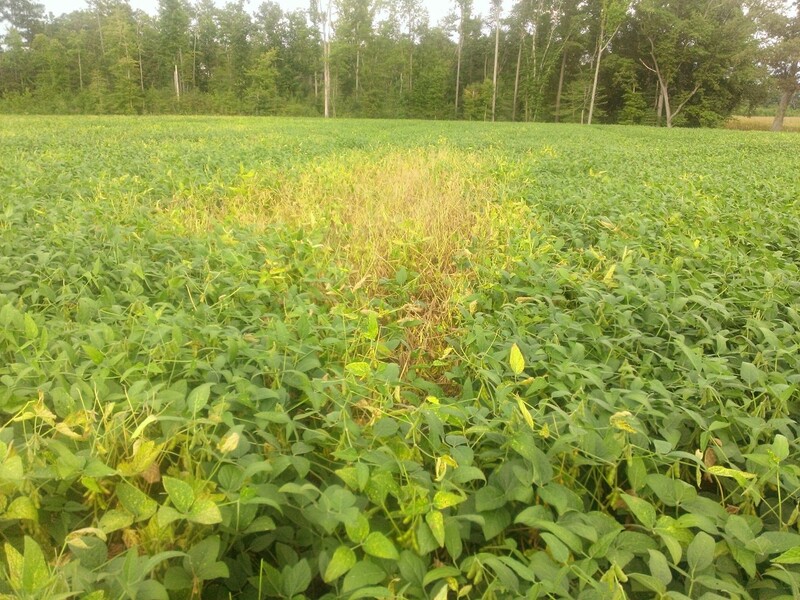 Also, you may want to select a variety with resistance to that disease when you plant soybean in the field. Finally, as mentioned earlier, take a nematode sample. Just because you’re seeing SDS or BSR in your field this year doesn’t mean that you have nematodes. But anything that is restricting root growth could aggravate SDS or BSR; therefore the symptoms would be more evident in fields infested with nematodes.